Some technical and non-technical people keep asking me how I create new designs. As often, after a few personal replies, I end up heading to the blog to share the answer as they keep asking for more. Also, I long wanted to write a pragmatic and step-by-step introduction, howto and tutorial to Openscad. The idea is to help people even with no programming skills (mostly in this part) and to bring newcomers to a point that they can design their own 3D objects (part two). Interestingly, Openscad is a really interesting tool to use to get a glimpse at what programming is because you get an immediate, visual feedback of your actions. Once understood, it may be much easier to move to other languages. If only a few readers become "designers" by reading this I will be quite happy. Meanwhile, I will have given a detailed answer to my friends and contacts! A non-obvious GoPro mount of mine, that is fully customizable thanks to Openscad. It looks complex, but it is still exclusively made of spheres, cylinders, and cubes with a few basic "joints". 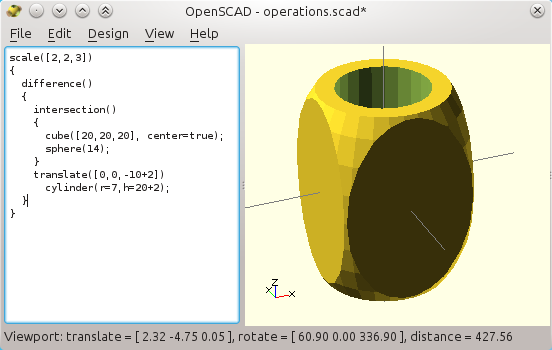 A forthcoming last part will deal with the complex features of Openscad. This one is for people that either learn fast or for those that are already proficient with the usual features of Openscad. So first, what is Openscad? Within the CAD family, it is a 3D modeler: a software that helps you to create 3D objects. There are many such tools, but this one is used extensively in the 3D printing community, not only because it is free but because is it really efficient for some kind of objects. It may or may not suit your mind, but with time I am able to "see" the shape I describe, not as text but directly as shapes. I guess it depends on people, but I am sure there are people that are not programmers that can think alike. And if you are already a programmer with no industrial goal then you really should give it a try. It will be a breeze to use up to a productive level, especially if you do not want to invest time in a new and hellish interactive user interface! The official manual is OK but it does not really work as an introduction. The navigation is also sometimes difficult to the point google is more useful. There is a nice raw cheat sheet also but it has no link to the respective functions (what a pity!) (update: it does now!). In any case, these fail to help to learn Openscad quickly in my humble opinion.